Dorothy McKibbin was responsible for welcoming new recruits to the Manhattan Project. Known by many as the "gatekeeper" to Los Alamos, McKibbin ran the Santa Fe office at 109 East Palace for the Los Alamos National Laboratory during World War II. She checked in the many scientists who came through Santa Fe on their way to work on the development of the atomic bomb, issuing passes and briefing them about life in the Manhattan Project. In this interview, McKibbin recalls the strict security measures in place in Santa Fe and Los Alamos and also discusses Klaus Fuchs. She also speaks about day-to-day life at Santa Fe, including the women who came to work on the Manhattan Project. Groueff: A lawyer, I see. McKibbin: We were a large family of four. My sister, who was older than I, died. My father always had the summers off because they closed the law courts in Kansas City on account of the hot summers. We had beautiful trips together, and a very fun time. Then I came out to Santa Fe with a touch of TB in '26 and cured at Sunmount, which is just above here. In a year, I was well. I married a man named Jonah McKibbin who lived in St. Paul [Minnesota]. I lived there four years. He died after four years. I had a son who was ten months old. I have never married again. I decided that I want to bring up my son in Santa Fe rather than the civilized life of a city, so I came out here. Groueff: Why did you choose Santa Fe? You lived there before? McKibbin: Well I had cured here for TB. I had met a lot of people, and I loved the artists and the beauty of the surroundings and the climate. There's something about this altitude of 7,000 feet, comes right up from the ground into my feet and out through my head and goes up. It stimulates me. Other people, it makes soporific. It's fascinating, the study of how it affects different people. McKibbin: My brother, for instance, would come out here, and he'd be so sleepy for the first ten days that he wouldn't want to do anything. He's the same inheritance that I am, but with me--zoop! And you wash your floor and it's fun out here. I got a job as bookkeeper at The Spanish and Indian Trading Company. I worked there part time as my son was a child, went to nursery school and public school. I learned a lot about this country and about the artifacts and the ruins, and about all of the Indian lore and so forth. When I was in bed at Sunmount, I had very little TB, but I studied all of the country around here, Tulsa Pueblo and Acoma, and did drawings of the Enchanted Mesa while I was in bed. Learned how to make pottery, while you're in bed, of all this mud. So when I got up and was able to go around, it was fascinating to see things that I had seen in books. But then, in working at The Spanish and Indian, it was a great thing for me because I learned all about the crafts of this country, of the Indians and Spanish and so forth. This is why, as receptionist for Los Alamos, I was able to take people around who came to Los Alamos from all over the country. Groueff: You knew the whole area very well? McKibbin: I knew the scene. I knew the area and the Pueblos and the dances and things to do and so forth, and I loved doing it. I would go into a museum with someone and find what they wanted. If they were painters, I would take them in there, go to the Folk Art Laboratory of Anthropology. The whole thing has just been fun. The Spanish and Indian was liquidated during the war. I had to work. I was so disturbed in '43 about world conditions, having heard Vincent Sheean speak from Prague. Remember that speech, before the Germans walked in? He described the fields before they walked over them. McKibbin: I thought that well, my son was thirteen. I can't be a WAC or a WAVE or anything. I would like to get in something of the war, but in New Mexico? Whoever heard of that? I'd read a book called Plumes by Laurence Stallings. McKibbin: Yeah, after World War I, which was against war and against violence. I thought, "I'll take my son out, and we'll hide under a pinyon tree and nothing will ever get him." Look what happened here; we were the one sensitive spot in the world. I said, “Well, I'm sorry!” I said that I wanted a job. I told him why. I wouldn't have to work very hard and it would be short hours and so forth. About two weeks, he called me up. I took an exam in typing. I was excited. I typed right off of the line, and I flunked the exam. This made me furious. I operate better under adversity than I do under non-adversity, if you know what I mean. I went back and took it again and passed it. Then I flounced into the bank, and George offered me the job. He said, “A project.” We stalled around. He wouldn't tell me a thing. McKibbin: I knew that it was a California outfit because there was a man in a brown gabardine suit. There weren't very many brown gabardine suits in Santa Fe in those days. There weren't many suits that had the jacket matching the pants. You know what I mean. His name was Muncy. Joe Stevenson was an ex Santa-Fean who had been out to Berkeley for some training course, I had heard, and had come back here. He was the Project Manager for a thing called Project Y. He wouldn't tell me what it was. Groueff: So he was the one who contacted you? McKibbin: Yes. I said, “Well, can’t you tell me something about it?" I said that I don't know anything about it. The time was running out in which I had to give them an answer. In my job sitting at that desk, all of the young people would come in for Los Alamos. They would have to wait in Santa Fe until a bus or a taxi--the taxi was any kind of a car that you could get. It wasn't a taxi, but we called them taxi. It was like the trip to Verdun in World War 1. They commandeered everything that they could get. Very often those youngsters would have to stay in town until a car came down to get them. About eight of us went over at La Fonda to have lunch. I was waiting there to join them in front of the newsstand in the lobby. I saw Joe Stevenson. The time was running out when I'd say yes or no. I saw with Duane Muncy, the man in the brown gabardine suit. We were just chatting. I saw a man approach us from the lobby. Groueff: That was in La Fonda? McKibbin: I knew that he was connected with the job because he was a stranger here. Those two men didn't know anyone in Santa Fe expect Joe, wasn't seeing much of me. He was busy getting this thing started. Muncy didn't know a soul here. They spoke to him, therefore I knew that he was connected with this project. I thought that anything with which a man of that magnetism was connected was what I would enjoy. Groueff: Even after five minutes? Groueff: But he didn't talk to you, or just a few words? McKibbin: He said, “How do you do?” He may have talked about one thing with them. I don't know. It was just a moment. He didn't stop to talk. Groueff: He impressed you so much? So I went in and was secretary. All of the young people came through that office. Groueff: You became secretary to Stevenson? McKibbin: She didn't work for us after a few weeks, and then I became secretary to Stevenson. Since March 27, when I was hired, to the first of May, the administrative offices of Project Y were at 109 East Palace. Oppenheimer, John Williams, and the other people there stayed at La Fonda and different hotels and came into that office. We had five offices around that patio. He rented the whole patio for us. He went under the name of Mr. Bradley and rented it from Mrs. Field, who owned the whole thing. Groueff: Who was Mr. Bradley? Stevenson? McKibbin: No, no. Oppenheimer was Mr. Bradley, and rented the whole thing. We had all of those five offices. Dwayne Muncy, the business manager, was in one. Dana Mitchell from Columbia was head of procurement. He was a PhD in physics. Over at the left was E. U. Condon and Mrs. Bemus in personnel. In front, where the Shop of the Rainbow is, was the housing manager's office where I was, and a small staff. These young husbands and wives would come in with their babies on their shoulder and come into our office. We would say, "Hello and how are you?" And take care of their baggage and see if they got a ride up to the hill. Groueff: Most of them didn't know actually what it was about? McKibbin: Anything. They knew that they were to go to 109 East Palace for the duration of the war, and that here was a room in the patio. That was all. They had no place to house them at Los Alamos. They took over five ranches between Santa Fe and Los Alamos: Del Monte, which was a dude ranch; Ancon, which was a dude ranch, the Scholar House, which was a private home, and the Cable Ranch, that's four, which was a private room. The owners got out. They were paid for exclusive use. The two dude ranches could not take in any other dude. They only had to take the employees of Project Y, which was an unknown thing. It was the war. Everybody is distracted. A lot of the men were away, so they were glad to rent their ranches. Tthe job with us was to get food out to them and to see that each one was run on a different plan. One had a built-in manager, the other had a wife being a manager and so forth. We had to get food out. They were on ration stamps for meat. They were on ration stamps for tires. They were on ration stamps for shoes. All of those problems came into our office. Women were settled in the ranches. The cars who left from our office everyday, this bus system we called "taxi system." McKibbin: Plus GI who left every hour on the hour, with these GI drivers who are just bored to death with this assignment because they thought that they were going to get something much more important than this. Groueff: Of course they had no idea about Los Alamos. McKibbin: Beat up land, taking all of these men up there, and leaving them and bringing them down every day. So we had to write a pass. I was notified by telephone in advance who was coming in and to give them a pass. So there was never any surprise to that. I always had the name in advance or knew who they were and would come in within a day or two. Groueff: Who was at your main office, Oppenheimer's office in California, at that time? McKibbin: Palmer Laboratory at Princeton was one of the addresses. The other was the one in Berkeley. I forget the name of it now. McKibbin: Well, there was another name to it, the physics department. All mail was censored and sent to Box 1663, which the GIs took up in armored jeeps to the hill. Groueff: This box was here? That was also part of your job? McKibbin: No, it's just that that was the address that I gave them to which they would write and to which their families would write and so forth. So, up they went. Oppenheimer was in the office every day with his secretaries and with Mitchell and all of these other people. Groueff: He didn't move immediately? McKibbin: Until the first of May. McKibbin: And then the buildings on the Hill were finished, as probably John Manley told you. The administrative offices moved to Los Alamos. We carried on like crazy, housing all of these new people coming in and sending them to the ranches. Groueff: But where was this Frijoles? McKibbin: Frijoles is the ruin about eleven miles away. They took that over. The US engineers took it over; it was operated by the Army. We housed about 100 people there for some time. Groueff: You had to live there, or you commuted there everyday? McKibbin: Yes, but it only lasted briefly because it was sort of a miscalculation on arrival of people and didn't turn out to be as extensive as we thought. It was very flexible in those days. You did what you were told. You asked no questions. When I was hired, I was told never to ask a question and to never ask for a name to be repeated. Groueff: Did they tell you about the Project or not? Groueff: No. You didn't know what you were doing? McKibbin: I did say to Joe Stevenson, very softly. "Joe, has this anything to do with the war?" McKibbin: That's it. That's the second reason that I joined. The first was Oppenheimer's personality. I didn't know that he was the director of it. I just knew that he was connected with it. Groueff: You thought that he was Mr. Bradley, or you knew his name? McKibbin: Oh, no. I didn't catch his name. It would haveve meant nothing to me, I'm not a scientist, if I had. Groueff: But later when you saw him every day here, you knew him as Mr. Bradley? McKibbin: Mr. Oppenheimer, of course. Groueff: But that was his false name? Groueff: Because wasn't there some curiosity here in the local people? Groueff: They knew that you were in charge of those strange people? Groueff: Actually a lot of them are even foreigners and with accents. McKibbin: Right, and very young, some of them, and so forth. Groueff: What did the local people think? McKibbin: They found out that they couldn't get one word out of any of them about what they were doing. They found that they lived at Box 1663. That was that. Groueff: So this office here, the head was Stevenson? McKibbin: Until the first of May and then he was transferred to Oak Ridge. Groueff: And then, everybody, Oppenheimer, Stevenson, everybody moved to Oak Ridge? McKibbin: To Los Alamos. I was left in charge of the place with only one room plus a second room where my secretary sat, who received the people and sent them into me for passes and stuff like that. Groueff: That you did for how long? Until the end? Groueff: Until the Trinity test and all of this? McKibbin: I did that until June 30, 1963. McKibbin: I worked there twenty years, two tenths. Groueff: Because there was always somebody to pass by? McKibbin: Oh, yes. We thought, toward the end, of closing it. I recommended that they close it because Los Alamos was known. There were maps even with the name on it. Many people would fly in, particularly from Albuquerque on cargo. But then, our housing situation, which has always been, as my son would say, hairy, got worse. We had to house a lot of the new people coming in in Santa Fe, so I had two hostesses who worked under me who would visit these new people and make them happy. And then, they would want so much to move to Los Alamos. Eventually they would, but we had them on there temporarily. So the office flourished. It really did, and justified its existence I would say until June 30 of '63, and then it was closed. I retired at that time. Groueff: I see. But, during the war, little by little you learned about Los Alamos. You knew that they were laboratories there, and what they were doing? McKibbin: Oh, yes. I would go up there, and would go into the Technical Area for meetings and for conferences, and get instructions on things that were happening and on what to do, and so forth. Groueff: So, you learned, little by little? Groueff: Did you continue working or seeing Oppenheimer? McKibbin: I'd see him socially. Groueff: But not in your work? Groueff: You were connected mostly with whom? Who was your boss or director? McKibbin: John Young was the Employment Director for thirteen years. I was under him. McKibbin: And then he was promoted to Head of Public Relations and I was under Charles Canfeild. He was the Personnel Director. We did a lot of interviewing in later years and during the years, and during the war, and sent people up who got jobs up there. We did a lot of screening of people because everybody, as the war was over, would come into our office to get a job at Los Alamos, no matter what they could do or what they couldn't do. It just seemed to be the glorious gold mine about which they had heard, and they all wanted work up there. I had very close touch with the employment offices here, and with different agencies. Everyone would come in. I had two assistants at that time. We would interview these people. If they were qualified, then we would give them applications and make an appointment for them to go up for an interview or to mail their application in. That way, we got some very good people. People would come through Santa Fe who were traveling through who had been at other laboratories or in the war or so forth. They hear about this, many engineers we got, and they would come in, we would interview them, and up they'd go. They had a summer program of graduate students from the colleges all over the United States. This is after the war. Groueff: That was after the war, yeah. McKibbin: They had about a hundred of those coming in every June. They were instructed to come to our office first. We got them rides up and so forth. You got to know those young men and women. It was all delightful. Groueff: So you were the liaison between Los Alamos and the outside world? McKibbin: Right, in a very lay capacity, not in a scientific—we always referred them to the interviewers up there. Groueff: During the war, did you see Oppenheimer's office? Groueff: Where was it, and could you describe it? McKibbin: Well, Hazel can describe this to you because she worked in it. It was in A Building, which has been torn down off of Trinity Drive. Groueff: A Building. Was it near the [Ashley] Pond? McKibbin: It was on the second floor. Yes. Groueff: And the Pond? Overlooking the Pond? McKibbin: Yes, a little bit west of the Pond. It didn't overlook the Pond. The Gamma Building where [Robert] Bacher worked and some others overlooked the Pond. It was across the street. They had two runways across the street where they could walk from the second floor of those buildings. They didn't have to go out in the rain or didn't have to show their passes or anything. Groueff: I see. It was just a simple office? McKibbin: Oh, yes with GI furniture and very simple. Groueff: He worked alone there with the secretary? McKibbin: Just a couple of secretaries, yes, and people running in and out in a conference room off of his office and so forth. McKibbin: She became secretary to Mr. [Norris] Bradbury, but he had the same office that Oppenheimer had and so forth. Groueff: But I would like to, if you could repeat your description of Oppenheimer, physically and all of this about horseback riding and about his wife. Would you mind? Groueff: He had to have a pass? McKibbin: Yes, that's right. For relaxation, they would like to run over the Sangre de Cristo Range and down into Cowells, where he has a ranch now. And that means you would leave Los Alamos in the morning and camp in the mountains at night, and get to Cowells say noon of the next day. He and his wife would do this. They always had a GI soldier on another horse protecting him. They loved to do that. He's very much at home in this country because he's been out here since he was seventeen or eighteen or nineteen with his brother Frank, riding up and down these mountains. Groueff: So he knows it very well? Groueff: He doesn't look like somebody who would like horseback riding. McKibbin: He loves it. He's very much a native when he's out here with his hat and his denim pants and his boots. Groueff: He would always dress like this, with this big hat and boots? McKibbin: Yes, very much at home. He could sleep underneath a truck when they were looking for a site for Trinity. They say that he was much more at home out there in those deserts spots than any of the other men who were with him. He loved this country. He's a part of it. Everybody here loves him. The Indians love him! The natives love him! They feel that they can have access to him. They can talk to him. Groueff: How does he speak? I understand that he masters the English language in an extraordinary way. McKibbin: Yes. He speaks beautiful English. He has a poetic phrasing when he makes public speeches that is very charming. He writes beautifully. He cuts things right down to the essence. There are no extraordinary words used or anything, just the necessary verbiage. Groueff: But it comes easy? McKibbin: Very easy. He speaks slowly, and he thinks before he speaks. Groueff: His general manner is quiet, smoking his pipe and thinking? Groueff: I also wanted to ask you, who among the great scientists there were personally close to him? McKibbin: [Hans] Bethe, John Manley, Phil Morrison, David Hawkins, who lives in Boulder now, [Raemer] Schreiber, Al Graves, [Norris] Bradbury is the one he selected, [George] Kistiakowsky. Groueff: They were all friends? McKibbin: Yes. Cyril Smith, Sam Allison. Groueff: I'm going to see Allison and Smith in a couple of days. McKibbin: Kenny Bainbridge. It's very hard to not omit some very important ones. Stan Ulam, who had been here since the beginning; they were good friends. Nick Metropolis who was on the MANIAC, Johnny Van Neumann. All of those people. Groueff: Not [Edward] Teller only. [Robert] Bacher was close? McKibbin: Yeah, Teller was in his councils and he included him in everything. Groueff: Hans Bethe can give me some good detail? McKibbin: He can give you the names of all of these people. Groueff: What kind of a man is Bethe? I haven't met him. He's a German who immigrated here, no? McKibbin: Yes, and his wife is German and beautiful and charming. Hans is tall and dignified with a lovely humor. He speaks well. He's an outdoor man. Groueff: He speaks good English? McKibbin: Yes. There is an accent, but very good. McKibbin: He likes to climb Truchas, which is the highest peak around here. He loves to ski. He's a mountaineer. So many of those people saw more of the mountains here during the war than these natives and the people who live here had seen in fifty years. Groueff: But when you meet him for the first time, does he give the impression of somebody calm or emotional? McKibbin: Very calm, very thoughtful, and extremely brilliant! McKibbin: By saying "slow," I mean that he doesn't throw it at you. Groueff: Yes, he's not an extrovert. McKibbin: No, he's a thoughtful scholar and scientist. Groueff: A serious--solid, something solid about him. McKibbin: [Enrico] Fermi is another one to include in this group, and Dana Mitchell from Columbia, and a lot of those people from Columbia. And of course [James B.] Conant was out a lot. They were great friends. All the great scientists that had to do with nuclear research were the men who were close to Oppenheimer. Groueff: They used to meet after work, also? McKibbin: Oh, yes. When they had parties, which they did, everybody bringing their own dishes, and all of the wives doing the work the work, they talked at the parties. The men would all get off and talk shop. The women would get off and gossip. But a lot of the women were scientists, too, you see. Groueff: Mrs. Oppenheimer was a scientist, but not in this field. No? McKibbin: No, she's a biologist, I think. She also loves flowers and plants. She worked with them a lot. At Princeton, he built a greenhouse for her, where she does a lot of that work. Groueff: So it's quite a passion for her? McKibbin: She worked in the hospital because everybody contributed their work in every way, the women did. She helped analyzing things at the hospital. Other people, like Mrs. Cyril Smith, taught school. 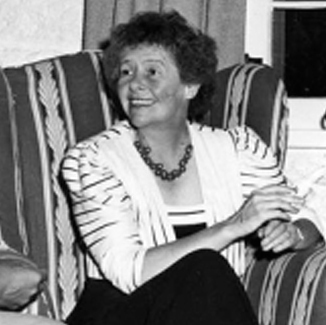 Jane Wilson and Bob Wilson were close colleagues of Oppenheimer’s. Jane taught school too. They started a library up there. Groueff: Everybody tried to help somehow? McKibbin: Yes, they started a library to have books in what they called the “Big House,” which is now torn down. We each gave five dollars. They had books given and loaned and purchased. This has developed into the Mesa Library, which is a public library. It's one of the finest in the Southwest. All of these things started just from wives' interests or people from people pitching in and doing things. Admiral Parsons was on the school board. Bradbury has been on the school board for six years. They're not too busy to give up night after night to things that go on at Los Alamos, to make the people comfortable and happy. Groueff: So it was a very good community? McKibbin: Yes. Let's say sociology, because the husbands were paid exactly what they were paid at the university from which they came. Groueff: I learned about their salaries. They were very modest. McKibbin: Yes, so there was no competition for whom was getting what salary. They were paid what they were paid at the universities they left. You were allotted housing on the point system, so many points and so forth. It was a very democratic community. The housing was terrible. The houses leaked. The furnaces were inadequate, and they scattered grimy greasy dust all over the kitchens, and all over the floor and all over the furniture. The furnaces, which fired up four apartments in those GI houses, they had Native gentlemen to be stokers. They didn't care whether they fired it up at night or daytime. They would turn on all of the heat in the middle of the night. There was a clanging and banging. Everything was done very fast. The scientists and their wives pitched in and did most of the real work. A lot of the young scientists would come down here in trucks under Dana Mitchell, who was succeeded by Harry Alan, who you've seen. There have only been two heads of that procurement department. These PhDs in Physics come running down to go and pick up things to go up the Hill. Everybody did any kind of work. There was no work that was too menial. A lot of it wasn't menial. Groueff: There was a lot of enthusiasm. When they remember those days, you can see the nostalgic feeling that they have for this. McKibbin: There's a glow that comes over every face when you speak about it. It's much more than people who have gone back to a college reunion. It was the radiance of the intensity of the effort that all of those people, the husbands and the wives, made to make this go. McKibbin: Because many of these youngsters were told that they wouldn't have cars out here, they sold their cars and they came out and they didn't have cars. The men walked. They got bicycles or they bought beat-up cars. It was during the war. You couldn't buy a lot of cars. These houses had cooking stoves that were fired with wood or with coal. That was hard. They called them "black moriahs." It was awful hard to cook in them. If they had a party up there—five neighbors. One would cook the meat in the electric roaster, you see, that you could plug in and carry it over to the house. Another would make the salad and bring it over. And then, the next day the wives would all congregate and wash the dishes. You couldn't get any help. The Indians came up and worked by the hour in the houses, but you couldn't get anyone to really stay and to take of your children. They would come up and work in the morning and leave that night and go home. There wasn't room for them to live in the houses anyway. They were so crowded. All of these people had children just coming out of the windows of these houses. The sons of these scientists delivered newspapers. Of course, they were paid for it when we had a newspaper, which was later. They all did all kinds of work. It was a community effort on every scale. Groueff: Quite an extraordinary experience. McKibbin: There were no telephones in the houses. There was only a telephone, say, in the doctor's quarters. Groueff: So everybody would go? McKibbin: Everybody would have to stay there. They would call, and he'd have to get into his jeep and run and get another doctor. The wife would have to get another doctor if this doctor was on duty. There were no conveniences. Milk was not delivered to the door. They had to go to the PX and get it and carry it home in their hands or in a basket. The first reply was, "The sidewalks." Groueff: They didn't have sidewalks? McKibbin: Yes, there were no paved streets at all and no sidewalks. You would step over building material and Dewayne Muncy, this businessman, speaking of, got a nail right through the sole of his foot. They had to shoot him to the hospital for tetanus. There were building materials—they were building all of the time. You'd fall into a ditch that wasn't there at five in the evening because they'd make the ditch between five and seven to put the pipes in to get the things started by the next morning. You wouldn't even know it was there. You'd fall into it in the dark. There weren't streetlights. Groueff: And then, the rainy days, probably it was muddy. McKibbin: Oh, mud would come into the houses up to the ankles. There was mud and nails. I didn't think that I'd ever live to see the day when they weren't hammering and sawing up there. Groueff: But people couldn't move their furniture or personal belonging or beddings and things like that. It was all given [to them] by the government? McKibbin: Well, they did bring their furniture in. All of that came through our office. We made out lists and saw that the trucks took them out and delivered them up there. But a lot of the furniture was GI furniture. Groueff: I see, and they didn't have much room. McKibbin: In the houses, because they didn't want to send their furniture from Chicago or New York, a lot of them bought secondhand pianos. I helped them to get those, and helped them to get them up there. Groueff: Who were the musicians there? McKibbin: Oh, Otto Frisch played the piano beautifully. Teller played the piano a great deal. Even the doctor had a piano, Dr. Henry Barnett, in his quarters that they played, or that everybody came in to play. There were pianos in schools. The school system was laid out in a very progressive system that's been copied all over the country. Groueff: Did you see General Groves when he came from time to time? McKibbin: He came very often, but he didn't come from my office. The military had an office in the Bishop Building. He didn't have to go through there. He went directly up. Groueff: I see. He had his own suite? McKibbin: I have met him, but I was working for the scientific laboratory and not for the Manhattan District. Groueff: So you didn't have much contact? McKibbin: Yes, I saw a great deal of Fermi because he traveled all of the time. You see, he'd have to leave his permanent pass at Los Alamos when he left. He'd go by taxi to Santa Fe and then by bus to Lamy, and he would usually stop in our office to see how things were going. And then when he came back, he had to come in to our office—they all did—to get a pass to admit them up there to pick up their permanent pass. Groueff: What kind of a man was Fermi? McKibbin: Well, he was quiet except that his eyes just burned right up. I met him standing against the wall. You'd just see those eyes coming out. He was pleasant and rather smiling and not missing a thing, human-wise or any other way. Groueff: He wasn't the type of noisy Italian extrovert? McKibbin: Oh, no. He was very quiet. McKibbin: Very modest. He loved the mountains. He would hike up the mountains. He would be outdoors a great deal. They are wonderful to their children, all of these young people. They were young then. They would take them on these all-day hikes, and children of two would be strapped on the back, and taken up to Lake Peak. I've lived here for thirty years and I've never been to Lake Peak. Groueff: Mrs. Oppenheimer, where did she come from, from the east? McKibbin: Her father worked with Bethlehem Steel as an engineer or as a scientist of some type. She lived there. Her name was Puening. I think she was of German extraction, and she met Robert out on the West Coast. Groueff: That was when she was a widow? McKibbin: Yes, but she had married again. After that, she got a divorce and she met and married Oppenheimer. Groueff: I see, but is she an intellectual? Groueff: With a good education, as you said? Groueff: Biologist. And interested in books and in intellectual things? McKibbin: And in people and in amusing things and in children and in horses. McKibbin: Dogs, they've always had dogs the Oppenheimers. There were dogs. Groueff: They had dogs in Los Alamos? McKibbin: Yes, oh yes. And, they would ship the dog back, and the dog would travel with them in the car. They always had dogs. Groueff: All the scientists--New Mexico, for the Eastern ones, it was a great adventure, to be for the first time in the West. It was like an expedition? Groueff: You mentioned these dances. Where would people meet to dance? In Santa Fe or Los Alamos? McKibbin: Yes, Los Alamos. They had what they called dormitory parties. I met [Isador] Rabi at a party. Of course, I met him at the office. But I mean, I’d just stand and talk with him. And they would dance. Of course, these scientists rigged up the most wonderful music all through the dormitories. It was wonderful music. It was only after the war that they would come down here and dance, you know, a jukebox. Groueff: What music did they have in Los Alamos? McKibbin: Records. They wired it up so it was beautiful orchestration and volume, and so forth. Groueff: It was quite gay for the young people? McKibbin: Yes, it was. They hiked a lot. There were many girls, and many of them married each other. McKibbin: Yes, or scientists. We had a few women scientists and technicians. Groueff: It was not a strictly masculine society? McKibbin: No. You had all the secretaries, who were very fine and well-educated gals, to get jobs up there. Many of them came. Priscilla Green came with [Robert] Oppenheimer. She had been a secretary to E. O. Lawrence. Because of her knowledge of this radiation move, she came with Oppenheimer, and she was excellent. Groueff: She was the principle secretary? McKibbin: Yeah, she was his confidential secretary. Under her there were quite a few. There was Anne Wilson, who I spoke of, who was the daughter of an admiral. Shirley Barnett was the wife of Henry Barnett, the pediatrician. They were all college-educated women who wanted jobs, war effort jobs, many of them. Quite a few married the scientists. The nurses in the hospital were very fine people. There were young doctors and scientists. Groueff: You said that a lot of those girls secretly admired Oppenheimer? Groueff: They were under the spell of his charm? McKibbin: I was speaking of him before he was married, when he was a young professor in California. His charm was well known. Groueff: Well-known as a young professor? McKibbin: Yes. Oh dear, all those names can come back. I do not mean to take up all this time.You asked me another question. I would say that the Santa Fe office was a liaison between the outside world and the laboratory. We tried very much to protect the people up there from time-wasting things. We also tried to expose them to very good and interesting ideas and people that came through. We had to watch those passes very carefully. Groueff: You did not have any problems with security or anything? McKibbin: Yes. I knew several times of enemy agents. McKibbin: That is what they could have been, or investigators. Groueff: Why would they come to your office? McKibbin: It was the only place they could come to. It was connected with the Hill. It was connected with the Project. Groueff: They had some official capacity? McKibbin: They were trying to get information. Groueff: They would come to your office? Groueff: You would know in advance? McKibbin: They would ask for passes to go up. I would ask whom they were to see, and they would not know, and I would not give them passes. Groueff: You would notify the intelligence people? Groueff: Anybody who would be too nosy about Los Alamos was suspect? McKibbin: Right. The G2 had their agents on every train that came from Las Vegas to Albuquerque. Practically every drug store had an agent in civilian clothes. All the nightclubs and hotels had them. Groueff: What, in the personnel, or just among the clans? The agents? Groueff: Unfortunately, that is what happened. [Klaus] Fuchs. Groueff: Did you know Fuchs? Groueff: He came through your office? McKibbin: Oh yes, through the office. Groueff: What kind of a man was he? Shy? McKibbin: He was very shy. He was very tall and slender. He had high coloring, thick lips and owl-like glasses. Groueff: Not a very handsome man? McKibbin: No, but attractive. He was very shy. He was very good-looking, I thought. He was very nice-looking. He was tall and straight. He had a nice head. Everybody liked him very much. He was so quiet and so gentle. The wives thought he would be fine to babysit for them, which he often did. Groueff: He was a kind and polite man? McKibbin: Yes. And certainly secretive, and no one up there had any idea. Groueff: Nobody suspected. I talked to [Richard] Feynman, who was his neighbor and friend. McKibbin: People would say to me afterward, that you could not trust anyone, after what had happed with Fuchs. Groueff: You were personally surprised when you learned? You would not expect anything from him? McKibbin: Never, no. He was with the British Mission, you see. There were about forty of them. Their address was 10 Downing Street. Their other address was the British Embassy in Washington. That was their other address. They were cleared, our President thought, by the English. They did not run tremendously deep, heavy clearances on them. Groueff: On the American side, yes. McKibbin: They were taking the British word for it. [Rudolf] Peierls and his wife Eugenia, who was a very interesting woman, had a lot of children. They loved to come and camp, to enjoy this country. He was a sort of protégé of theirs. Dr. Peierls was as surprised as anyone was, when he heard about it. Groueff: He was surprised too? Groueff: What a tragedy that was. Groueff: The others, like Greenberg [misspoke: David Greenglass] and the Rosenbergs, they had nothing to do here? McKibbin: I never met them. I met [David] Greenglass as a sergeant in going through. I do not remember him. Hundreds of them came into our office. We averaged about sixty-seven people in there per day and 110 telephone calls per day. We were really very busy. I could not wait to get in there at 8:00. It was hard to get away for the lunch hour. Groueff: How did you talk on the telephone? McKibbin: We had a Forest Service line when the war was on. It went from Santa Fe to Los Alamos. It was a very inadequate communication. The squirrels would chew on the line and in a storm it would fall on the ground and be out of work for a long time. You would have to yell on that line. They could almost hear you yelling at Los Alamos from the Santa Fe office. Groueff: Was it dangerous, from a security point of view? McKibbin: I never thought of that. McKibbin: I did not know anything. What would we talk about? That "So-and-so’s arrived and will be up, and a car will get them there at certain times. So many children are with them, or someone else was with them," and so forth. "Their husbands did not come, or did come." There were different details for housing. My communications were with personnel and with the housing office. Groueff: Did you have buses every day? McKibbin: Every hour, we had GI buses that would take thrity people in the bus. Groueff: Every hour? That is quite an organization. McKibbin: We would have taxis, which were staff cars. They were sedans and closed cars that would take people back and forth. Groueff: It was quite an organization. Each one of those drivers had to be cleared? McKibbin: Yes. They were GIs, the drivers of these buses. They were cleared before they were sent here. They were picked personnel. Groueff: But they were military, sort of, painted the khaki color? McKibbin: Yes. Many of the young scientists, we called GIs. They were assigned here. They lived in dormitories and barracks, because we did not have housing. The "Government Issue" is what GI means, as you know. They wore their uniforms and went to the laboratories in, or not in, their uniforms, and worked very hard out there. Many of them are still up there. Many of them left after the war and took further degrees, then came back. Many of them married. Groueff: Your office was strictly civilian? McKibbin: Like me, they were civilians. That is right. The drivers of the GI buses were, of course, in uniform. The drivers of the sedans, which we called taxis, were not. They were civilians. They were cleared and told to drive up.